In '68 the Great Quake shattered California from top to bottom, leaving a maze of windswept mesas and perilous sea channels brimming with precious ghost rock. The Rail Wars raged as Rail Barons fought to reach California's riches first. Only one of them can lock up the Maze's lucrative ghost rock trade, and first they have to go through Reverend Grimme and his fervent followers! 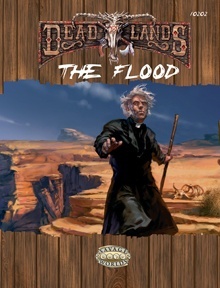 The Flood gives you all you need to explore the Weird West Coast-a complete Plot Point campaign, details on the strange locales and famouse personages of the Maze, new Martial Arts Edges and weapons for kung fu masters, steam vessels, and a whole mess o' Savage Tales to boot. Your seat's reserved on the Lost Angels express, amigo. Next stop-the Great Maze!